Flames shoot up from a building in San Jose after a vehicle slammed into it. 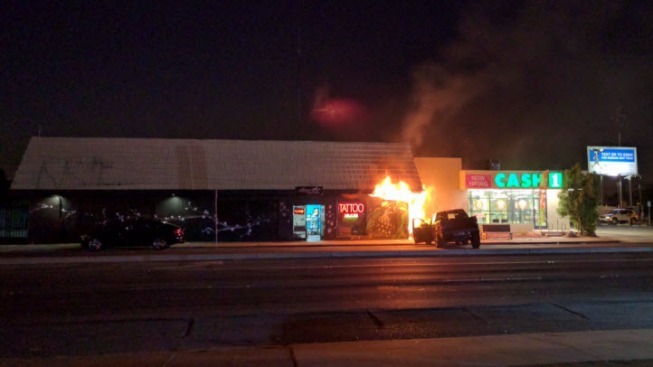 A car smashed into a tattoo parlor in San Jose on Tuesday night, rupturing a gas line and causing a fire near downtown. About 8:35 p.m., San Jose fire crews responded to a two-alarm blaze at a tattoo parlor in the 1100 block of West San Carlos Street, near Lincoln Avenue, and found gas flowing into the building. Firefighters backed off the fire initially due to safety. They were able to knock down the fire about an hour later. The flames were isolated to the roof line and did not get into the building, fire officials said. The fire was fully under control just before 10 p.m., fire officials said. The building sustained minor fire damage to the roof and exterior components, however officials said there likely would be water damage on the inside of the building. The two occupants of the car were able to get out safely before the fire started, fire officials said. Nobody was inside the building at the time of the collision, and no injuries were reported. It was not known what caused the vehicle to hit the building.